Farther vs. Further – Which One To Use? Farther vs. Further – Which One To Use? Home › Grammar › Farther vs. Further – Which One To Use? 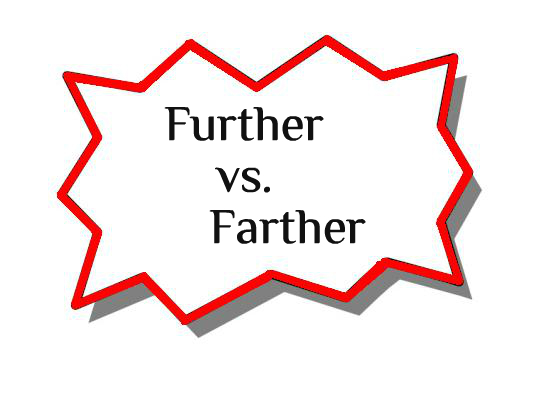 Have you ever wondered about the words ‘farther vs. further’ and which one to use? Chances are that like most of us, you have. They are just two of the many words in the English language that can be quite confusing. The majority of them sound, are almost spelled the same and often have the same meaning as well. Since both of these words mean greater distance, are almost identical in pronunciation and writing, the confusion is easy to make. But the truth is that if you take a closer look at them, you will be able to tell them apart and use them properly when the time calls for choosing between farther versus further. You may also enjoy reading A While vs. Awhile – Which To Use? The word farther is much more easy to remember using an easy definition. That’s because farther is and should be used to refer to actual physical distance between things. The best way is to think of the word ‘far’ in farther. When you need to distinguish between farther vs. further, remember the ‘far at the beginning’. That’s because ‘far’ is obviously in reference to physical and real distance. If you think of the actual physical distance in time (months) when it refers to pregnancy, then using ‘farther’ would also be correct. Just in case you may still be a bit confused or unsure about further vs. farther and which one to use, here are some more examples. If you go farther down the street, the parade should be visible. Once he got up, he realized that he had fell farther than expected. As we continued driving, the homes became farther apart from one another. from each other than he expected. Hey Dad, how much farther do we have to drive to get there? Your honor, I have no further questions for this witness! Samantha took Robert’s hand and moved it further away from the fire. The teacher felt he did not need to explain the lesson any further. “Young lady, you are grounded until further notice!” said the angry father to his daughter. The only reason you wanted me to stay here further was so that I would babysit for you. After the bill was passed, congress gave no further explanation on the matter.